Last Year a collection of Bloggers all got together to put together the Storm Wardens which all money raised went to Doctors without Boarders. Well it’s time to up the anti and they are looking at building FOUR 3000 point armies to put into the raffle this time around. Every dollar of your support gives you a chance to be one of the lucky four new army winners at the end of this drive.10 dollar contribution =10 chances to win. 100 dollars = 100 chances…you get the idea. 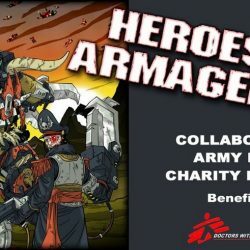 So go over to the Heroes of Armageddon website or click on the link I’ve put under the affiliates on the left for more details on this and Enter the draw to help out with Doctors Without Borders and have your chance to win something!